Murphy beds are increasing in popularity especially due to the expensive, limited space in several rented homes. A Murphy bed’s folding capability is its biggest advantage. It enables you to fold it up to occupy a smaller space then extend it back outwards to occupy a bed sized space at will. Therefore, as you are struggling to make it after college in your studio apartment or as your family increases in size, a Murphy bed is guaranteed to give you some extra space to work with during the day. With this in mind, below are the top 10 Murphy beds for sale. 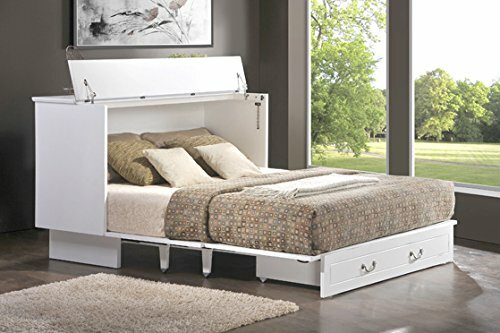 The Nantucket Murphy bed chest has a compact design, making it convenient for tight spaces. The drawers are telescopic and together with the chest’s front panel, form the mattress support when fully extended. These parts can be folded back together, forming a chest like shape, and hence its name. It comes with a cooling gel memory foam mattress that can be folded into 3 pieces, all 6 inches thick. The 3 piece mattress design enables it to be folded as you extend or retract the drawers and panels. This mattress has the ability to disperse body heat easily because it is breathable. This gives you a cool sleeping surface while still retaining its rigid support. The bed is available in twin and queen sizes, giving you an option for the kids as well as for yourself. Both these sizes come disassembled but putting the pieces together is quite easy. After assembly, the only thing you need to do is to pull out the drawers, panels and mattress before you sleep. When fully retracted, the twin size is 42 5/8 “wide, 24 3/8” and 39” tall. After extension, the length increases to 76” but the rest remain the same. The queen size measures 63 5/8” in width, 24 3/8” in length and 41” tall. This length increases to 82.5” when fully extended. In case it spoils, it comes with a 1 year limited warranty to cover you from any manufacturer related imperfections. • 2 built in USB charging ports. • Satin finish gives it a good, shiny look. • Available in white, grey and espresso colors. • Lots of moving parts affect its durability. • Assembly might be difficult to the non-handy person. Contrary to its size, it is quite easy to raise and lower this bed due to its dual piston system. It does not come with a mattress but it has a euro slat mattress support system that is meant to complement the mattress you place over it by providing additional comfort. This combinations will give you a comfortable rest after a long day at work. The bed is available in two sizes: full size and queen size. Both require assembly, with the full size bed measuring 18 1/4” × 58 5/8” × 83 5/8” when closed. When lowered, this full size bed extends its length from 18 1/4″ to 85 3/8”. This structure is designed to hold a standard full mattress that does not exceed a thickness of 10”. The queen size measures 20 1/4″ × 64 5/8” × 89 1/8” when closed. Its length increases from 20 1/4″ to 92 1/2″ when lowered, giving you enough room to place a standard queen size mattress, which should not be thicker than 12”. This bed is made in Canada and has a 10 year warranty from the time you make the purchase. This gives you plenty of time to use the bed free of any maintenance cost, just in case the factory replaced parts get damaged. • Modern silver trim and pull add a touch of class to its finish. • Saves a great deal of space, which is great for small, multipurpose rooms. • Assembly instructions might not be very clear. You might need to hire someone to put it together for you. 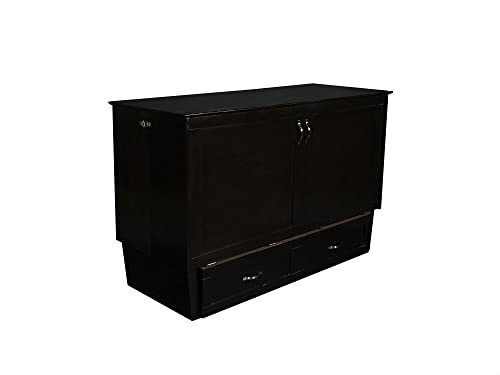 This Murphy bed has a credenza style cabinet when all the parts are folded in and it tops this off with a solid hardwood construction that gives it a vintage like look. It is available in queen size only and comes with a trifold, premium gel memory foam, queen size mattress as standard. This mattress comes with 3 year limited warranty, making it a worthy accessory. The bed is shipped in parts and requires assembly after unboxing, which is a fairly easy task considering the package includes an assembly guide to show you the steps. Apart from this, there are also a couple of YouTube videos that you can look into if you get stuck along the way. It has a length of 63 1/2″, a width of 23 3/4″ and a height of 41” when closed. This width extends to 83.1” when opened, giving you your queen size bed. 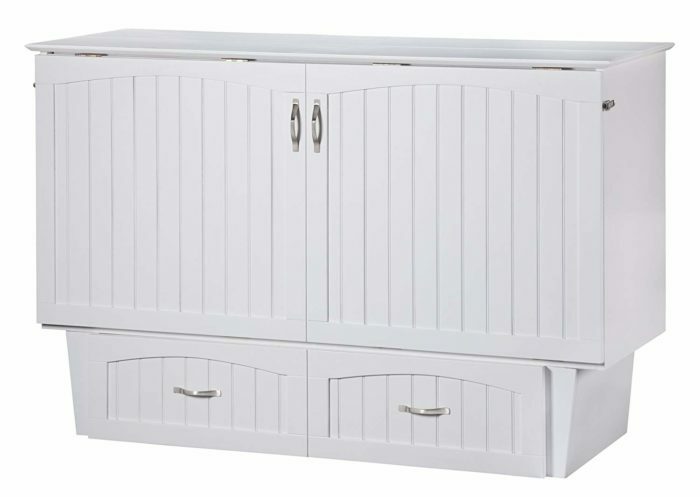 The cabinet bed comes with a 10 year limited warranty, which gives you free maintenance for a very long time. • Built in USB charging ports for convenient phone and tablet charging while in bed. • Short and compact design for tight spaces. • Cabinet can be used as a TV stand even as you fold and unfold the bed. • The bed is quite heavy, meaning that assembly is a 2 person job. The Bestar Edge wall bed incorporates practicality into its design. It comes with 2 storage units, one placed on each side of the bed. Each of these units has 2 fixed and 4 adjustable shelves, giving you a convenient storage location for your books and some decorations by the bed side. It is only available in queen size, having a length of 65.1”, width of 20.1” and height of 89.4” when closed. A clearance of 92.5” is required to open it fully and it does not include a mattress on the inside. However, it can accommodate any standard queen size mattress that does not exceed a thickness of 12” and should weigh at least 70 lbs. The bed is shipped in parts and requires assembly before use. However, due to its size and weight, assembling requires at least two people and this might be very challenging to the non-handy people. On the upside, it comes with a 10 year warranty, which puts the mind at ease considering the amount of money you sink into buying the bed. • Dual piston system makes it easy to raise or lower the bed. • Comfortable Euroslat mattress support system. • Available in white and brown colors. 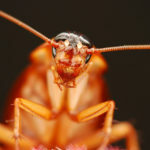 • Must be secured to the wall using metallic or wooden studs. • Does not include a mattress. As is standard with Atlantic furniture beds, their headboards are designed to complement most interior decor and this one is no different. The chest can be used as a TV stand or to hold a couple of things such as flower vases and picture frames. The bed is available in a twin and queen size and each comes with a 6 inch thick trifold, premium memory foam mattress. Each of them is shipped in parts and therefore requires assembly after unboxing. If you are the handy person, this will be a breeze for you but due to its weight, you might need a partner to help you out. The twin bed is 42 5/8” wide, 24 3/8” long and 39” tall when closed, and it extends up to 76” long when opened. The larger queen size bed is 63 5/8” wide, 24 3/8” long and 41” tall when closed but it extends up to 82.5” long when opened. Both sizes come with a 1 year limited warranty. • Available in white, espresso and grey colors. • Satin finish gives it a shiny look. • Assembly might be a bit difficult. • Not a very high quality product. 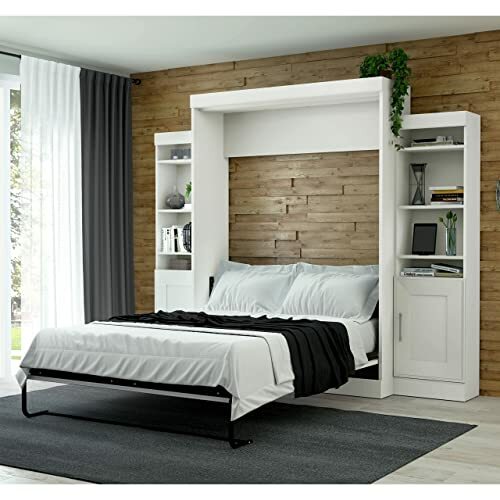 This Murphy wall bed is designed with simplicity in mind. It only has the wall frame and bed, making it weigh a lot less than other similar beds. 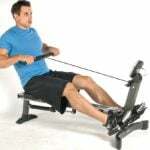 It is shipped while disassembled, with manuals and assembly guides included to make the task easier. However, 2 people are recommended to do the job due to safety reasons. The bed is available in two sizes: full size and queen size. The full size bed is 58.6” wide, 20” long and 83.6” tall when closed but it requires a clearance of 87.3” from the wall so as to let the bed down. The queen size is wider, measuring 64.6” wide, 20” long and 89.1” tall when closed. 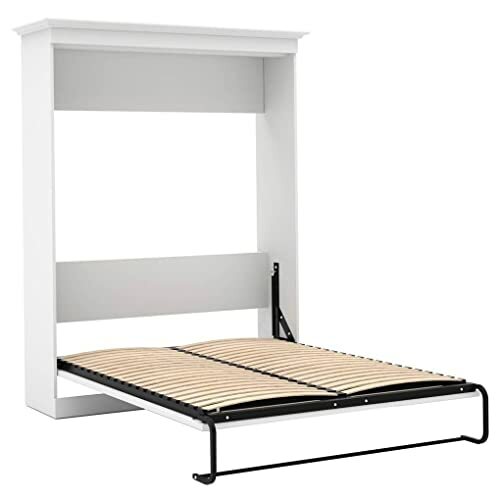 An 87.3” gap is required from the wall outwards, so that you can set up this bed when it’s time to sleep. Both sizes do not include mattresses their packaging but they have Euroslat mattress support systems. These systems can accommodate their respectively sized mattresses but they should not exceed 10” in thickness and should weighs at least 70 lbs. 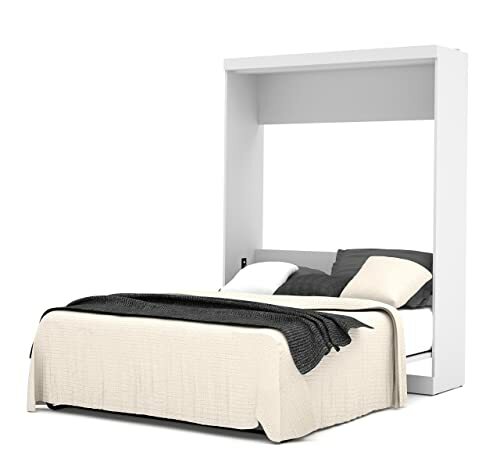 This wall bed is made in Canada and comes with a 10 year warranty. • Dual piston system simplifies the process of opening and closing the bed. • Must be attached to the wall. • Assembly might take a while. 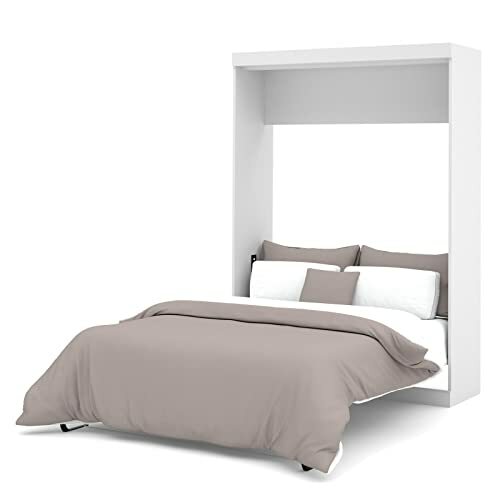 Bestar implemented similar concepts on this bed as they did with the nebula; a simple design and a lightweight body. It does not include a mattress but the full size bed can accommodate a full size mattress, which should not exceed 10” in thickness and should not be heavier than 95 lbs. Similarly, the queen size bed can accommodate a queen size mattress but it should be less than 12” thick and weigh less than 100 lbs. The bed requires assembly, preferably by two people because of setting up the long pieces. Overall, the full size measures 63.4” by 20” by 85” when closed. When opening it up, you will require a clearance of 93.4” from the wall outwards in order to lay the bed down. The queen size bed occupies a bigger space, measuring 69.4” by 22.6” by 89.9” when closed. A clearance of about 94” is required to open up the bed when you want to take your rest. It is made in Canada and comes with a 10 year warranty. • Durable scratch, stain, and burn resistant melamine finish. • A bit difficult to assemble. • Assembly instructions are not very clear. As the name suggests, this bed is available in a full size only and can only accommodate a standard full size mattress. This mattress should not be more than 10” thick and not less than 70 lbs. in weight. However, it does not come with such a mattress so it should be bought separately. The bed has an overall length of 83.6”, a width of 20” and a height of 85”. From this, the bed measures 58.6”×20”×85” while the storage unit measures 25”×20”×85”. The bed parts require assembly straight from shipping but this is not such a difficult task. On the downside however, it comes without any warranty and therefore any damage caused is on you. • Euroslat mattress support system increases the bed’s comfort. • 2 fixed and 3 adjustable shelves on its left side maximize your storage options. 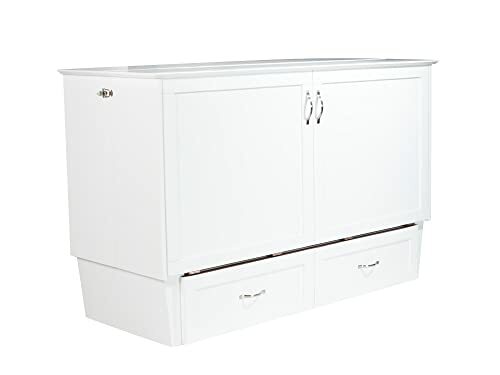 This cabinet bed is extremely lowered for fitting into tight spaces. It is only 43” tall and the cabinet top doubles up as a stand for various household items. It is 64” wide and 24” long when folded but this length increases from 24” to 83” when open, which is enough length to fit normal sized adults. The bed comes with a queen size, trifold, memory foam mattress, which is 6” thick and can be folded into three parts when folding the bed. However, the most interesting thing about it is the delivery service. The bed does require assembly but you are not the one to do it. It is shipped together with a white glove delivery service, who will take it to whichever room you want inside your house, assemble it and take away the debris, leaving you with a ready bed at the end of the day. However, this service is optional at an additional fee. This services eliminates the chances of incorrect assembly or parts damaging, especially considering that the bed has no warranty. • Small and compact design. Can fit in very tiny spaces. • Does not require to be bolted onto floor or wall surfaces. • Parts of it have a shoddy construction, affecting the durability of the entire structure. 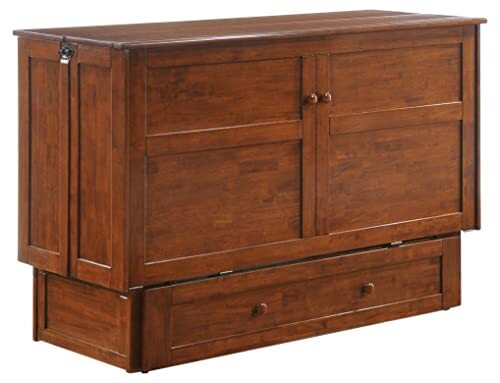 Atlantic chest beds are all designed to blend in perfectly with your interior decor. This one has a satin finish, which is shiny and blends well with your painted walls. It is available in twin and queen size, providing you with different options for the same quality. Both sizes are equipped with a fitting, premium gel-infused memory foam mattress, which is 6” thick. The mattress can be folded into three, enabling you to easily fold it inside the chest as you fold the bed. The bed is shipped in parts and requires assembly after you unbox it at home. Assembly instructions as well as video instructions are readily available in the package and online respectively, to help you out in the process. The twin size is 42 5/8” wide, 24 3/8” long and 39” tall when folded, but it extends outwards to reach a length of 76” when open. On the other hand, the larger queen size is 63 5/8” wide, 24 3/8” long and 41” tall when closed, but it extends outwards to 82.5” when open. Both sizes come with a 1 year warranty from the purchase date. • 2 built in charging ports. • Available in espresso, grey and white colors. • Assembly might be challenging to the non-handy individuals. 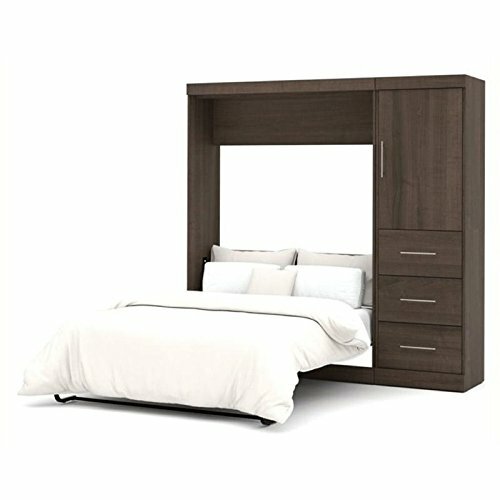 These top 10 Murphy beds for sale have different features which give them their strengths as well as their drawbacks. 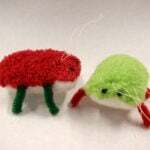 However, their biggest difference is the type. There are chest/cabinet beds and wall beds and the choice between the two is basically down to personal preference. However, regardless of the type, space should not be your problem anymore. The good thing with these beds is that you neither have to sacrifice comfort nor convenience and hence, they are good investments for your limited space.